Mitsuoka is the world’s premier maker of Nissan-based, sub-scale vintage Jaguar-ish cars. FCA (you know, Fiat-Chrysler) is a huge carmaker that’s going through a bit of a rough patch, including a failed attempt to convince GM that a merger would be a blast. Is an FCA/Mitsuoka partnership just what everyone needs? I have no idea. 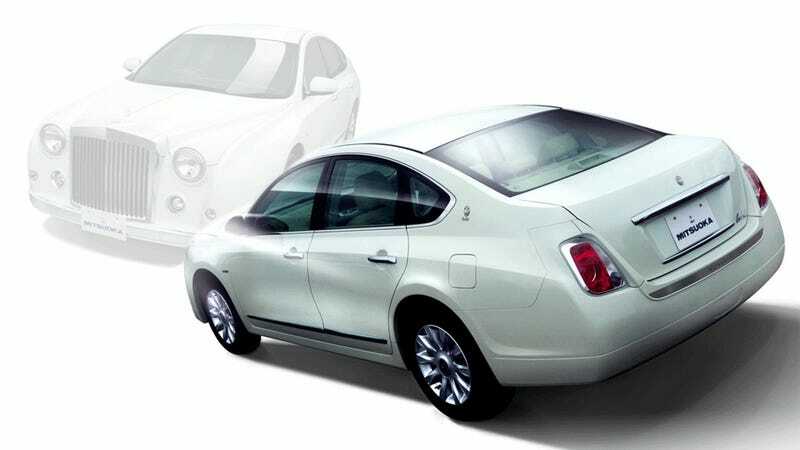 But what I do know is that the latest 2016 Mitsuoka Galue is using Fiat 500 taillights. Look for yourself! As far as I know, this is the only example of Fiat 500 taillights being used on anything that’s not a Fiat 500. Sure, it could be that Mitsuoka just found the taillights to be just retro enough to work in the context of the Galue and Mitsuoka is just buying them from FCA’s service parts department, or, if we extrapolate wildly, it’s the first indicator of a massive partnership between the two automotive powerhouses, and could radically propel both companies to never-before-dreamed successes. What will this mean for Nissan, the usual base platform of Mitsuokas? Will this finally mean Chrysler’s extensive American dealership network will be used to provide Americans with the Mitsuokas they crave? There’s no way I’m reading too much into this. This is huge. Those taillights are also in use on the hearse variants of the Galue. It’s also worth noting that this hearse looks like it would make a fantastic little camper, too. Replace that coffin with a sleeping bag and some snacks and you’re in business. I think I’ll camp out at the nearby Dodge dealership until they agree to sell me a Viewt.